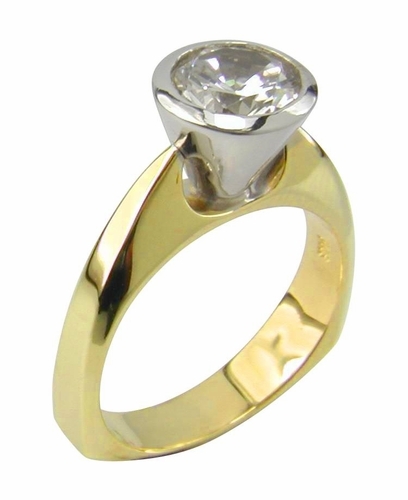 The Round Cone Bezel Set Cubic Zirconia Two Tone European Shank Solitaire Engagement Ring is a geometric inspiration! This unique solitaire ring has a 1.5 carat 7.5mm round that is bezel set in a 14k white gold cone shaped bezel. The Russian formula cubic zirconia round center stone is hand cut and hand polished to exact diamond specifications and can be cared for the same way you would take care of real fine diamond jewelry. 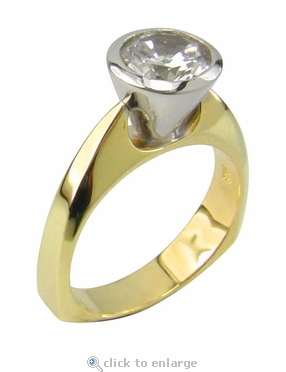 This European square shank solitaire is available in the two tone option as shown in the image with a 14k white gold cone shaped bezel and a 14k yellow gold squared off shank. It is also offered in solid 14k yellow gold, please call us directly at 1-866-942-6663 for a quote if you would like to have this ring make in 18k gold with a Platinum head. Due to extremely low pricing, all clearance sales are final.